Volume II relates the events from Sept 1, 1944 through the end of March 1945 when the ship returned to San Pedro, CA for repairs. During this half-year, the Boston participated in the Philippines Campaigns and Iwo Jima. The incredible story of the crippling of two US cruisers by enemy torpedo bombers off the coast of Formosa (Taiwan) and the subsequent retreat (with Boston towing torpedoed cruiser Houston) comes alive in these pages. The men relate some memories of the harrowing Typhoon Cobra that claimed three destroyers and 800 men. First hand accounts of what they witnessed on Iwo Jima will not disappoint you! Like Vol. 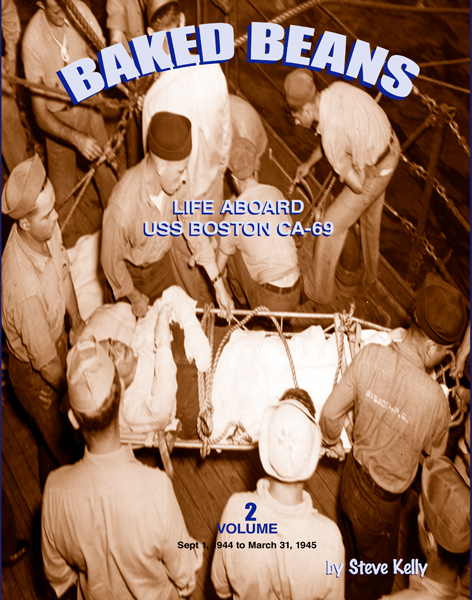 I, this book is loaded with primary-source materials: photos from the National Archives, official War Reports from the Boston and Cruiser Division 10, diary entries from two of the crew members, and first hand-accounts from men who lived through the events! Order Baked Beans Volume 2 directly from the author and he’ll autograph it for you before he ships it. Charge your purchase here using the secure PayPal site. You may use your credit card or your PayPal account. Order all three Baked Beans volumes directly from the author, and he’ll autograph them, take a little off the price, and pay for the shipping! Order all 3 Volumes and save.